If you’ve got access to a cable or satellite subscription chances are you’ve got the ability to activate the WatchESPN app and start watching live sports. It’s simple to activate the service and start watching live sports from Fire TV! Besides cable and satellite, you can also use some online streaming service to activate. First, download the WatchESPN app. Second, use the login information from your service provider to login. You can install the app a few different ways. 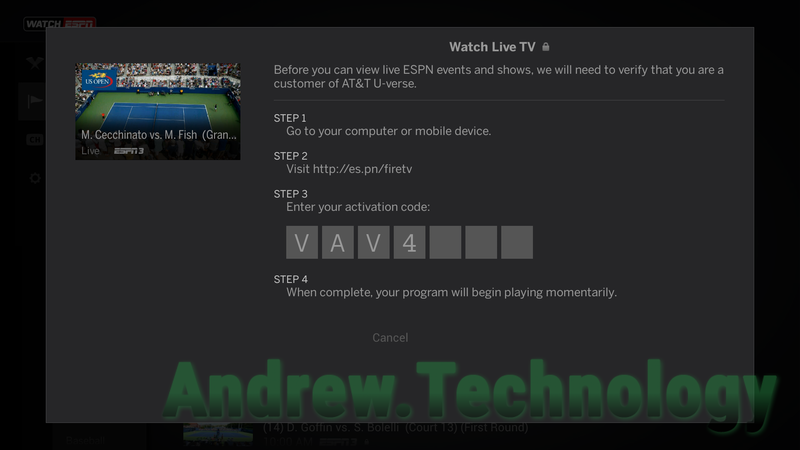 By using voice search on the remote and saying “ESPN” or through the Amazon website for the WatchESPN for Fire TV app located here or by clicking the WatchESPN Icon box to the left. It’s always free to download the app but you will have to activate after installation. The WatchESPN app will download and install creating an icon on your Home screen under Recent. Launch the WatchESPN app and the user interface will load up showing you different live games but they will all be locked until you activate. Go to your computer or mobile device. When complete, your program will begin playing momentarily. Once you go to the ESPN link it redirects to https://espn.go.com/watchespn/activate?device=firetv and this is the page you select your service provider (cable or satellite subscription) and enter your activation code. Once you fill in those details click Continue and that’s it! Your Fire TV will automatically update and be activated. It will redirect to the game you wanted to watch or you can select your sport of preference and start watching! The activation code will be displayed on the FireTV when it asks you to activate. The screenshot above shows the screen and on Step 3 it shows the activation code starting with “VAV4”. Though your activation code will be completely different it should show up in the same spot. If I have not cable TV just Internet and firetv how can I get ESPN? So am I wrong in thinking I have to have cable or satellite in order to view ESPN on my Fire TV.? I was hoping i didn’t have to subscribe. my internet provide is not listed how can I activate the ESPn App? I have Internet through WOW & a fire stick but no cable tv can I still get ESPN ?